Home » movies , transformers , transformers 3 » Look! A trailer for the third TRANSFORMERS movie! Look! A trailer for the third TRANSFORMERS movie! Made ya look! I should have been honest and said "Optimus Prime has a trailer for the third Transformers movie!" There's plenty more photos of vehicular-mode Transformers and associated wreckage on Ain't It Cool News this afternoon. 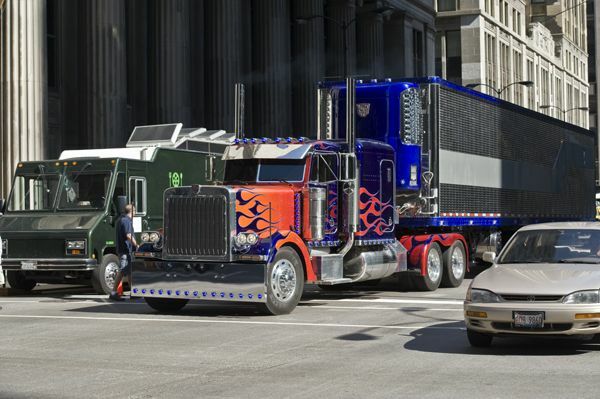 The rest of the pics look interesting, but that Optimus Prime pic looks mighty photoshopped. Hope they actually have a decent story on this one. T2 sucked monkey balls story-wise. SFX were pretty cool, though. I agree. Transformers: Revenge of the Fallen was too much concept smushed into too little time, with the twin Idiot-Bots thrown in as insult to injury. It can be an entertaining movie if you put yourself into the mood for it, but it could have been soooo much better.